An image from the documentary, Harvest of Empire (2012). My first ancestors to come to America journeyed on the Mayflower in 1620; it’s hard to have a heritage more firmly rooted in America’s beginnings and long history. Just under a hundred years ago, however, my grandmother on my father’s side left her native Holland and sailed into New York harbor, passing through Ellis Island before moving west with her parents. Growing up, I was much prouder of my Dutch heritage and status as a third-generation American than of my ancestors who established Plymouth Colony 300 years earlier. In the 1990s, I learned Spanish and spent two years living and working with the Latin American community in Atlanta. Our backgrounds couldn’t have been more different, but as I spent time in their homes and saw how hard they worked to build stable lives here in the U.S.—usually against great odds—I came to feel a real kinship between these migrants and my great-grandparents who brought their children here in the 1910s. Almost without exception, the men and women I knew contributed economically and otherwise to Atlanta, which couldn’t have gone through its post-Olympics growth without them. Ironically, discrimination and strict immigration policies were generally the worst obstacles these families faced as they worked tirelessly to build up the very city where they lived as marginalized citizens. Then in 2002 I took a Latin-American literature course in college and read Juan Gonzalez’s book Harvest of Empire. I immediately determined to someday adapt it into a documentary: it summarizes in minute detail how the United States’ foreign policy in Latin America, from the days of colonization on, has created the very influx of immigration that many English-speaking Americans find so distressing. It’s a part of the Americas’ history that I had never encountered before and I knew it needed a larger audience than was likely to read the book, even from as well-respected a journalist as Gonzalez (who was also one of the first to write about the health hazards in downtown Manhattan after the 2001 terrorist attacks). Now the book, which itself is in an updated second edition, has been brought to the screen by producer Wendy Thompson-Marquez and co-director Eduardo Lopez, who have years of experience in Spanish-language broadcasting between them but are here making their film debut. Harvest of Empire opens Friday in New York and L.A. and will soon roll into other markets and on VOD. We’re now in an election season when Latinos make up over 16% of the U.S. population. Sunday on ABC’s This Week with George Stephanopoulos, Ann Coulter said that immigrants have no civil rights because the United States hasn’t done anything negative to them. She supported this by stating, “Immigrants haven’t even been in this country.” It’s this type of rhetoric and misinformation that makes Harvest of Empire so necessary. Filmmaker: How did you approach adapting Juan Gonzalez’s book? Lopez: In the film, we don’t cover everything that’s in the book, which would have been impossible. So we focused on the regions closest to the United States: Mexico, the Caribbean, and Central America, and we chose a total of seven countries. In Central America, it’s my country, El Salvador, plus Guatemala and Nicaragua; in the Caribbean, it’s the Dominican Republic, Cuba, and Puerto Rico. So that’s really the focus of the film. The first part of the book is about the Spaniards and conquest of America. 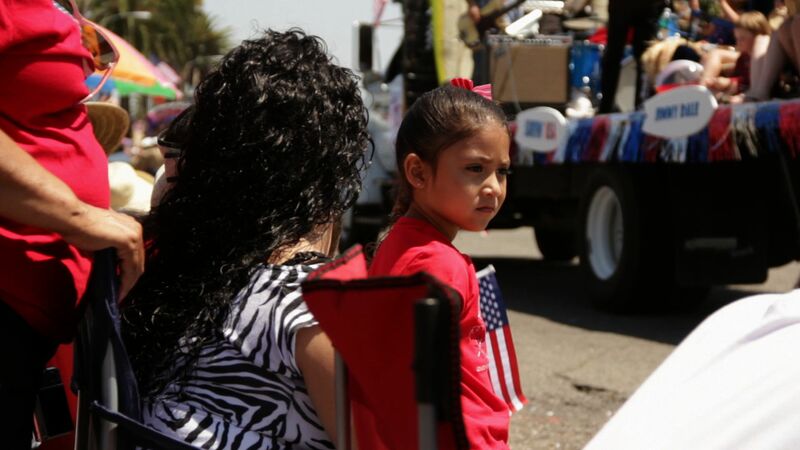 The second part is the history of how the waves of Latino migration to the U.S. really began. The third part of the book is Juan’s essays. So we really focused on the second part of the book. What was truly important was to talk about why Latinos came to the United States and the fact that when you look at the history of each migration from these different countries you very quickly find that American foreign policy, whether it were for military interest or for corporate interests, was very much involved in triggering the waves of migration when they occurred. In every country you will find that. As an American citizen—I grew up here since I was nine years old—I was never taught any of this in school. I had to discover this even after I left college. But all of these stories clearly show that the United States had a very large role in creating the waves of migration, and when we talk about immigration today we really need to take that into account. We really need to know that as Americans. Filmmaker: But that’s not part of the public discourse. Lopez: No, in the countless hours of debate over immigration that I have listened to, I have only heard one small discussion about history, and that was with Chris Matthews and Lawrence O’Donnell. Other than that, the countless hours of debate and fighting and complaining and accusations and scapegoating—none of those conversations talk about why we actually came. What exists is a stereotypical image of the Latino immigrant as someone who comes here and wants to take something from the success of America. What’s completely missing from our national conversation about immigration is the fact that not only have Latinos always been here in the United States and that Latinos have always contributed tremendously to the success of our country, but that the waves of immigration didn’t happen the way most people think. The waves of migration were very much connected to our own economic and military interests in Latin America. The long history of U.S. intervention in Latin America is missing from our national conversation about immigration. Filmmaker: Backing up a little bit, what attracted each of you to the book initially? Thompson-Marquez: Eduardo is Salvadoran and I am from Peru; we’re very in tune with the needs of the Latino community and we’re constantly looking for ways to learn more about the U.S.-Latino experience. Eduardo was the first to read the book and then he told me, “This is important. You need to read this.” At that point, which was in 2005, we started hearing so much negative rhetoric directed at the Latino community. We heard, in my opinion, comments that should not be used to refer to any community at all. But somehow they were being said about the Latino community without consequence, and most of the rhetoric was not based on factual information. So Eduardo and I thought that it was important to do a film on the book because we felt that by doing that we would be able to provide a historical context for the Latino presence in the United States. That was the driving force. Lopez: For me, it was extremely important to do what Juan did in his book, which is that for the first time a Latino had actually told the Latino story. For us, we heard so much ignorance coming out of the television debates about immigration that we felt very strongly that the time had come for Latino immigrants to tell the story of Latino immigration to the United States. Filmmaker: Was it organic for you to focus on the second section of the book, the history? Lopez: For me, personally, it was. It was very organic, very natural because El Salvador is perhaps the latest and clearest example of the direct connection between U.S. foreign policy and immigration. In 1980, the U.S. census found approximately less than 100,000 Salvadorans in the United States, and here we are 30 years later and Salvadorans are poised to become the third largest Latino population in the entire country. This is from the smallest country in all of the Americas. How did this happen? If the story told by the people who basically want to further the stereotypes of Latino immigrants was true and poverty was the driving force, then there would have been immigration from El Salvador forever because El Salvador is a country with many, many disadvantages. But what we find is that the influx of Salvadorans to the United States starts at the same time as the [U.S.-influenced] civil war that we as a country were very much involved in. And so very clearly there is a direct connection between our foreign policy, our military interests in the case of El Salvador, and the huge influx of Salvadoran immigrants to the United States. As a Salvadoran, I felt that it was very important to tell that story because I felt that the derogatory comments being made about immigrants, and specifically Latino immigrants, were not only ignorant but were really damaging the community in very real ways. That was in 2005, and now that we are in 2012 we see that the damage is even greater because now the rhetoric has become law. It’s become legislation. And it’s become harassment of entire Latino communities across the country. Filmmaker: Tell me how you came together and how you collaborated on the film. Thompson-Marquez: We knew and respected each other prior to starting the project, so working together was an easy process. I don’t have any film background whatsoever but I have a business background running television stations, so I think my main contribution was on the business side, finding ways to generate funds to support the film. Eduardo brought a knowledge of American history and Latin American history, but he also doesn’t have any experience when it comes to film production. So this was our first foray into film, and we made so many mistakes. Every mistake in the book, we made it. That’s why it took us seven years. But along the way we kept moving forward because we both understood what the primary goal was and we both believed that finishing the film was going to make a tremendous difference in the life of so many people. When you work on a project for seven years and you’re struggling to get to the finish line, you keep going back to the same thing: we’ve got to finish this project because it’s going to make a difference in the lives of so many people. I just came back from a prescreening in L.A., and the response that I received there was the same that we received when we prescreened the film in New York and even here in Washington D.C. at the Brookings Institute, which was that this is the first time we see our history together. No longer are we Mexicans, Guatemalans, Salvadorans, but now we are part of this collective group, which is Latinos here in the United States. The film has done a fantastic job in bringing that unity to people for the first time. We have differing histories, but your immigration experience, your immigration story is basically the same as mine. I think that’s why Eduardo and I worked so hard to make the film a reality. Filmmaker: What made you focus on the countries that you chose to focus on? Lopez: We chose them because we wanted to focus on the largest contributors of Latino immigrants to the United States as well as the regions that are closest to the U.S. Six of the seven countries are the largest contributors of immigrants, with the exception of Nicaragua. But Nicaragua also offered us a great opportunity to show this direct connection between foreign policy and immigration because so many people remember not only the Sandinista revolution but Iran-Contra. So it offered us another very good way of illustrating our main thesis, which is this connection between our foreign policy and immigration. The history of the migrations from these countries is evergreen; it will never change because it’s already occurred. We tried very hard not to delve too deeply into, for example, the status of “documented” versus “undocumented,” because very soon that might change completely. We wanted to have a film that is relevant today, but is also going to be relevant ten years from now. And I’m very happy to say I think we accomplished that. We allude to very recent events, like in Arizona, but we look at them from a perspective that allows us to have a film that will not be outdated in the next couple years. Filmmaker: Did you try to keep it from becoming partisan? Because the Arizona law is very divisive throughout the entire country. Thompson-Marquez: We worked very hard to stay unbiased. But depending which side of the equation you’re on, you’re going to think that we’re taking a side, that we’re not making your side, either the right or the left, look good. But it’s a very complex issue and it’s very hard to keep everybody happy. We tried to state the facts, we tried to focus on history, and then we hoped that people will make their own decisions. Lopez: I just want to say that both Wendy and I are extremely proud to be citizens of the United States of America. We are very proud to be immigrants from Latin America and to be from the countries that we’re from. And so that was a very difficult challenge for us because obviously many people will think that any indication of what the U.S. has done in the past that has had negative impacts either here or in Latin America is criticism of America. Very often you hear people, when anything of that nature is said, say, “Go back to where you came from,” or, “You hate America.” And that’s absolutely not the case. Thompson-Marquez: Or they say you feel like you’re entitled. I don’t feel entitled about anything. On the contrary, I feel very grateful and thankful. You know, I worked as a nanny for eight years, taking care of children, cleaning houses on the weekends, so I know what hard work and education can do for people. So there’s nothing that you can take for granted, especially when you come from countries like ours where you know that if you’re not born into the right families that you will never get ahead. Lopez: For us, the beauty of America is that you can tell your own story and you can help to educate your fellow citizens about your own group and hopefully make life better not only for your group but for everyone. I think that if more Americans understood the real reasons, the roots of Latino immigration to the U.S. and our own past involvement in those waves of migration, then that could really at least begin to spark dialogue about Latinos and our place in the United States. Filmmaker: Tell me about distribution. Thompson-Marquez: One thing is that Juan Gonzalez is well known and respected in several communities, not just the Latino community. That’s a great asset that the film has that’s really opened doors for us to reach, for example, the educational community, colleges and universities. We’re also working with a lot of immigration grassroots organizations, and I think that having Juan’s book as the driving force has been key for us. I tried to get the film into PBS, I’ve tried to get the film into HBO, but I never received any responses, no interest whatsoever, which I find very interesting. But we decided to just do what a lot of independent filmmakers have tried to do and self-distribute. We were able to work with the Laemmle Theater in L.A. and the Quad Cinema in Greenwich Village in New York to help us run for one week, and then we also reached a partnership with SnagFilms to be our partners with video-on-demand. We hope that this momentum will take us to the point where we can find a distributor to take it nationwide because there’s definitely a market and an audience. We hope to not just preach to the choir but to reach the mainstream. Filmmaker: Did you plan for it to come out during a presidential campaign? Or was that just how it happened because that’s how long it took you to make it? Thompson-Marquez: Actually, every time we discussed when the film was going to come out we thought that it should be during a presidential campaign: the issues around immigration become something that everybody is talking about. When we thought we were going to release the film four years ago, immigration was front and center, and things have not changed. We saw a window of opportunity for the film now. But it’s also the perfect time to launch the film because it’s Hispanic Heritage Month, September 15-October 15, and we wanted to use that window. Filmmaker: What do each of you foresee for yourselves moving forward? Are you going to try your hand at filmmaking again or was once enough? Lopez: I will also continue to produce a public service television program that I’ve been working on here in the Washington metropolitan area for the last 23 years. It’s called Linea Directa. It’s kind of a unique show because it’s produced in cooperation with NBC4, the local NBC station, and Telemundo Washington, so it’s a collaboration of a very small nonprofit, EVS Communications, along with NBC4 and Telemundo Washington. Filmmaker: What kind of content do you have? Lopez: Most Latino families depend on Spanish-language television for much of their news and information, but at the national level unfortunately there’s not very much information about life in the United States that can help our community move forward. So Linea Directa focuses on any issue that will help Latino families improve their lives here in the U.S. That could be public health, education, or immigration; anything from domestic violence to foreclosure fraud. That’s what we cover on Linea Directa.